Specializing in techniques that help purify, balance and renew the skin, Esthiology is about keeping the body beautiful and healthy. Our Esthiology program incorporates skin care, facials, body treatments*, hair removal, makeup application, business development, wellness and retail knowledge. This program does not include a hair design or nail certification. Aveda Spa Philosophy: Aveda's spa philosophy begins with Elemental Nature - a unique way of understanding our guests' needs that is grounded in the science of Ayurveda, Ayur means "life," and Veda means "knowledge." Ayurveda believes that the essence of five natural elements (infinity, air, fire, water, and earth) are found in all living things - including you. The skin and body reflect the balance of these elements. When skin or other physical concers surface, it could be a signal that an element is out of balance. Elemental Nature helps you restore balance through approprietly diagnosed product systems, a balance diet and regular wellness activities. The result is healthy-looking, balanced sking and radiant beauty. Aveda Rituals: Guest continue to tell us what they love most about an Aveda service are the Aveda Rituals. A primary focus taught through our curriculum are Rituals of Renewal. Every spa experience is a series of high-touch, high-impact connections between you and your guest. Facial Fundamentals: Student will learn about various skin types, conditions, and remedies. By the end of the Esthiology phase, you will be able to conduct skin analysis, perform facials customized for specific skin care concerns, and provide full-body hair removal. At our Portland Campus, students will also be introduced to body treatments in addition to makeup applications. 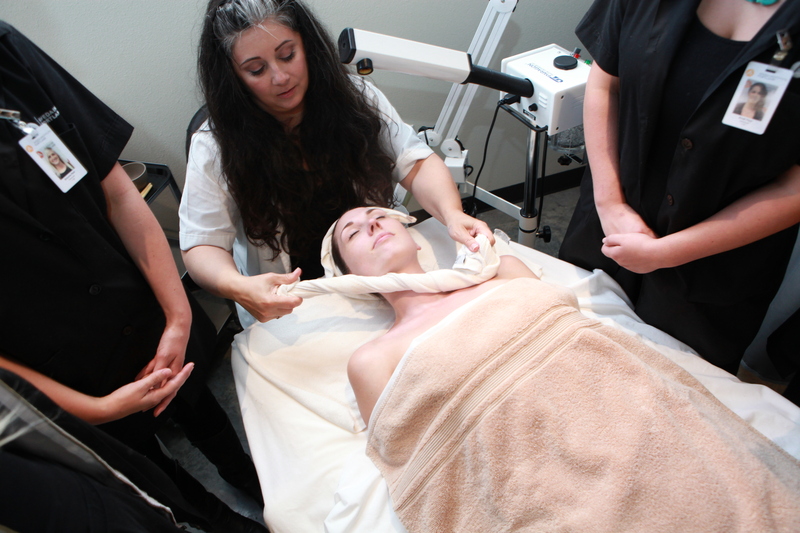 Treatment facials: Student at Aveda institute Portland learn a variety of treatment based facials meant to replicate popular chemical services, such as microdermabrasion and glycolic peels, with the same results and plant & flower based ingredients. Students will learn to assess when to recommend treatment based facials to guests based upon skin type and needs. 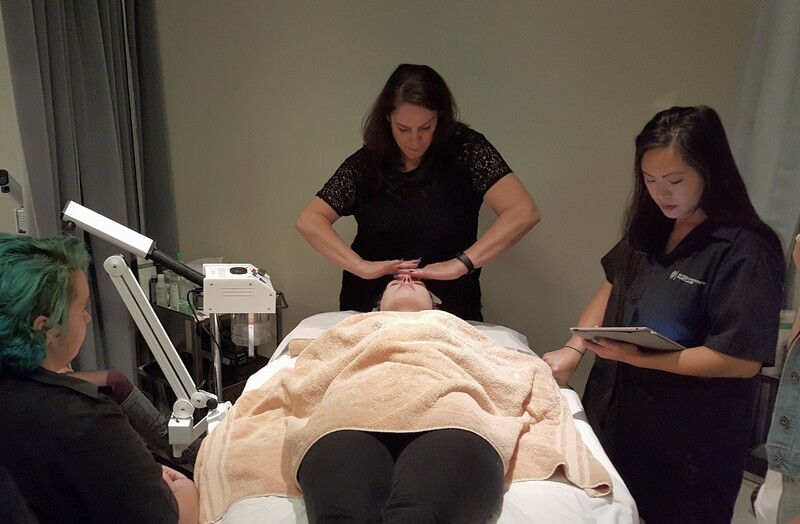 Student will learn a variety of high touch services meant to relieve, acne, and redness and to detoxify, improve elasticity and luminosity of the skin. Waxing: During the waxing portion of the program students learn to wax a variety of areas of the skin. They learn about the different type(s) of wax and how to use them during a service. Students will also learn the proper prep, application and post care needed for a variety of waxing services. Makeup: The makeup portion of the program is designed to give students a well-rounded look into makeup application. Student will be able to apply both a natural and bold look by the end of their program. There is also a strong focus in contour and highlight specifically for photography. Business: Students will become familiar with a variety of business-building topics to assist them in their Esthiology careers. Topics include: personal finance, industry pay scales, resume building, interview skills, and how to find the salon or spa you will begin your career after graduation. Spa Life: During the final phase of the Esthiology Program, students will be fully immersed in a salon-like experience, while being instructed and inspired by our licensed educational staff. In the student's final phase, they will further hone the skills they've aquired during their education at Aveda Institute Portland.